I believe this was the original dining room. But we have no way of knowing. For now, it’s the yellow room. When we first moved in, I wasn’t sure how to refer to these two rooms, which are seemingly one. It was suggested that I name them after folks I know, such as the Chet room, and the Roe room. But I couldn’t decide, and indecision lead to passivity, and before I knew it, Sam had the rooms named by color. 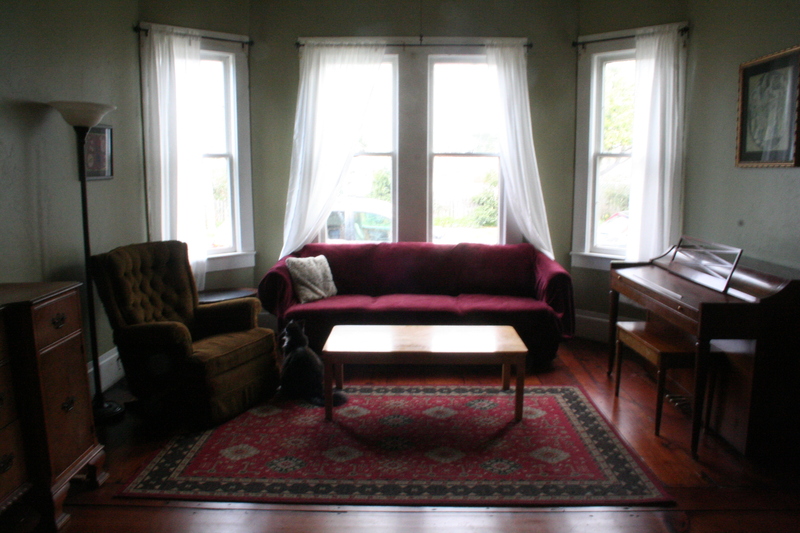 The east side of our living room, as seen from the other side. We want to build built-in bookshelves along that whole wall. It will be amazing. Someday. 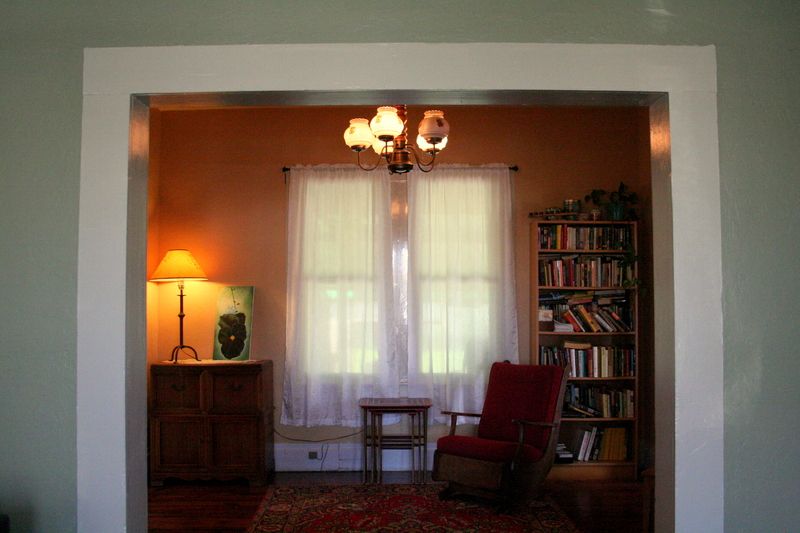 The yellow room is home to the blue drop-leaf table (against the right wall), the stove (left wall), and the red nesting tables (straight ahead). Heh. Nice chandelier, huh? We can’t even be bothered to put another bulb in. It’s hard to get an accurate photo of the two wall colors together. 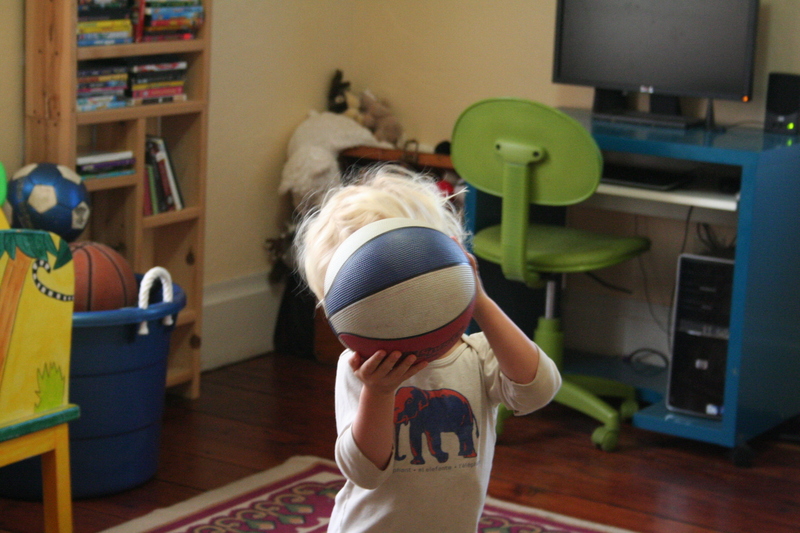 I mean, it’s hard because I have children underfoot and I was interrupting March Madness when I took this picture. The green is warmer than shown here. The old Zenith radio cabinet -- bought at an estate sale for $10. White doily -- from Grandma's house. Lamp -- locally passed-down. Painting -- copy of Georgia O'Keeffe's "Pansy 1926"
I found these in an antique store in San Diego — near Hillcrest or Kensington or somewhere near there. I was 23 with a new baby. I wish I had asked more questions. I know nothing about them, and neither did the antique dealer. The shop sold things on consignment, and these were tucked in a corner. At least I could have contacted the original seller. But anyway, I fell in love. 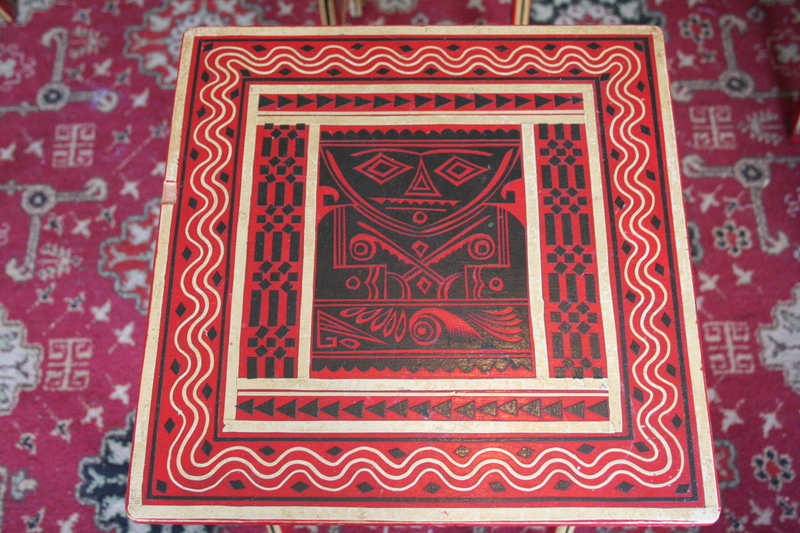 Top of the large table. 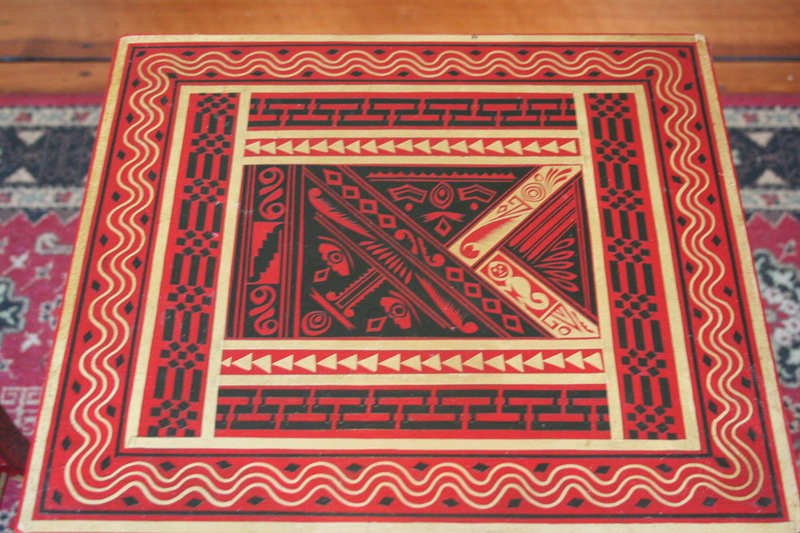 A friend once remarked that they were incredible, and maybe from somewhere exotic — somewhere like West Timor or Java or I don’t know, some place where beautiful things are made by hand with care. The middle table. It gets the least use, of course. 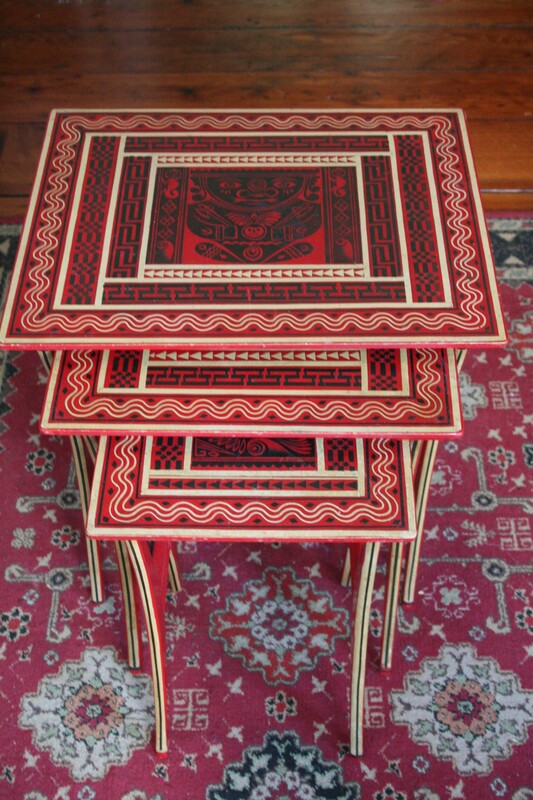 Or maybe they were somebody’s old tables, covered with paint and stencils and lacquer by a steady hand in his garage. The baby table. The kids sometimes get to use this, but I prefer to have them leave mama's tables alone. (Note the chip on the left side. It’s a good thing we’re having another baby because our room is a little lonely without Sam. 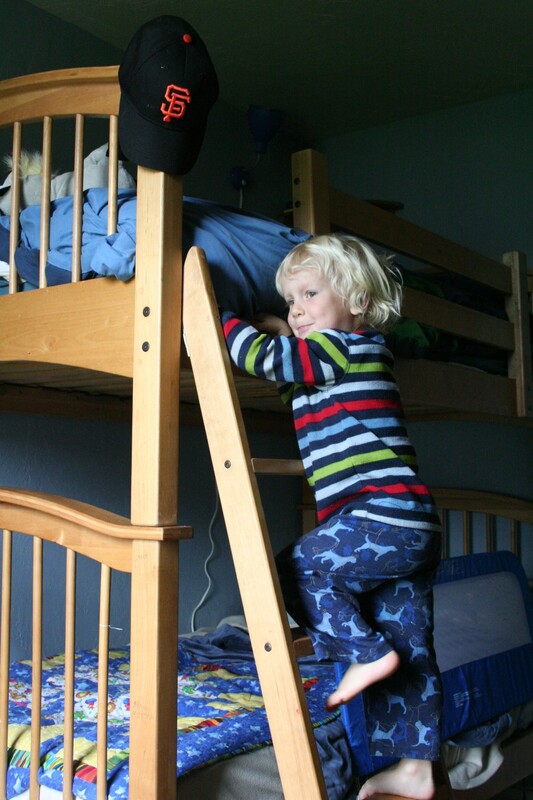 We got Matthew a new bed, and put the bunkbed back together in Max’s room. He loves his bed. 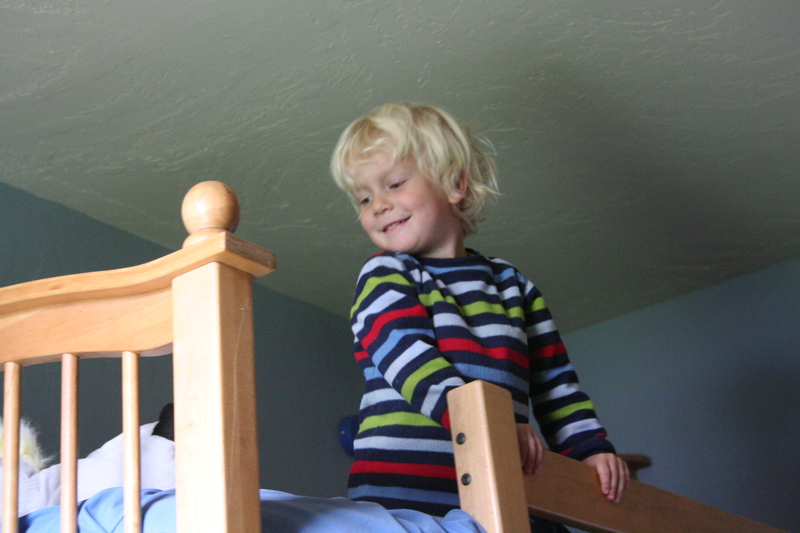 And Max loves the top bunk. 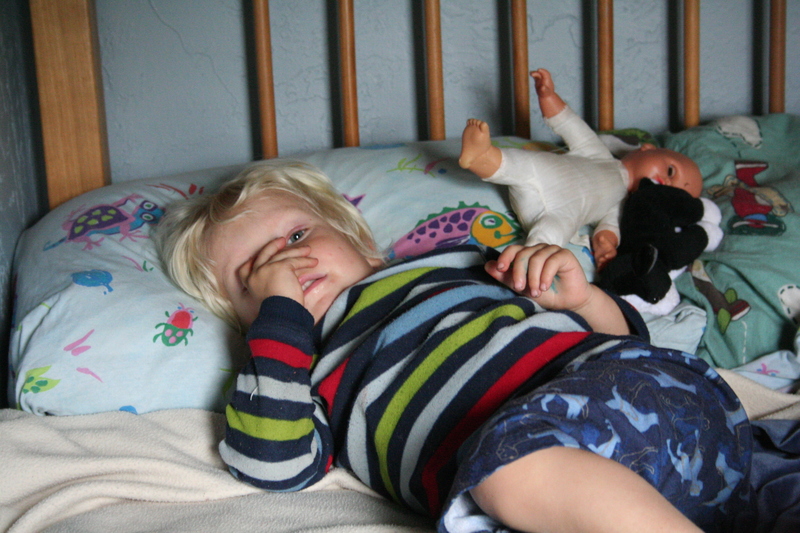 I’m not going to tell you how easy bedtime has been, because one must never express the good behavior of children publicly unless one wants to test fate and faith. It’s a comfortable mattress. Mom gave it to us in 2001 — it’s a good one. 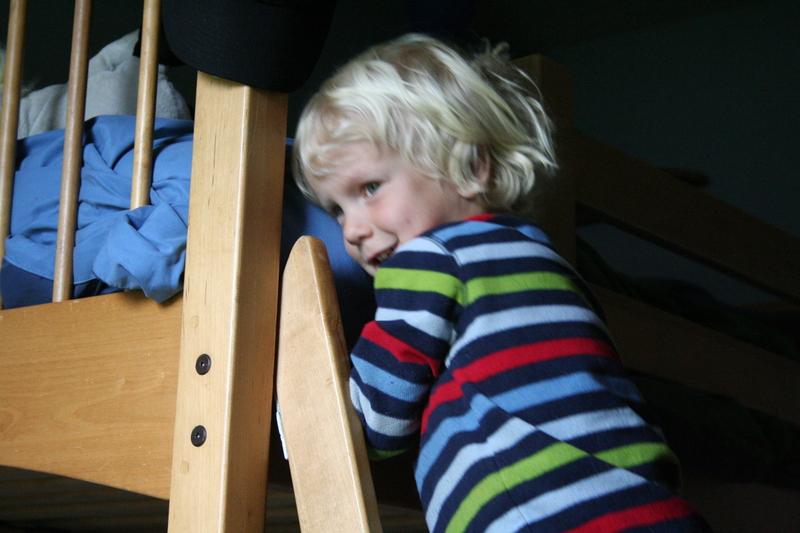 It’s cycling through the children (the young ones get the good mattress, since I spend so many nighttime hours on it myself). He hasn’t asked to come back to our room yet. 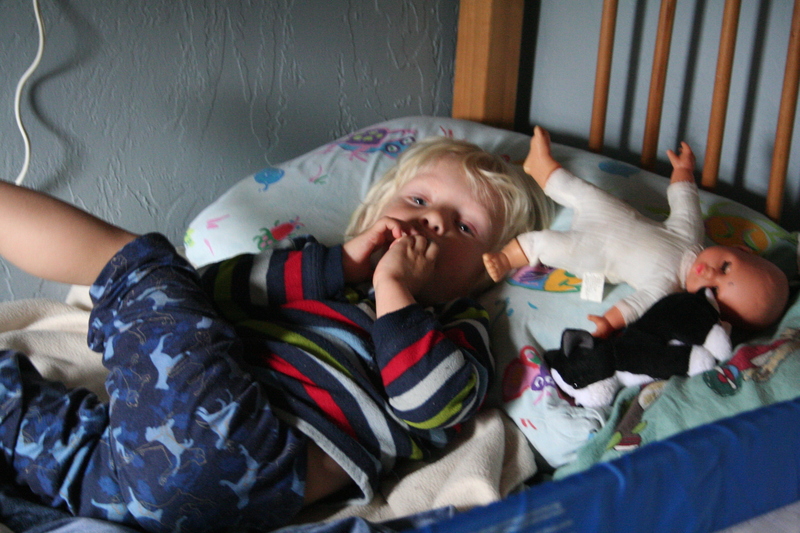 And in the morning, he sometimes calls, “Max!” instead of his usual “Mom!” I still can’t take down his toddler bed. From here he was looking through the window, watching his brothers play catch in the back yard. Sam. What more can I say? Oh, and it’s really fun to drop things from here. Not much to say about this space, but want to gradually give you the full tour. 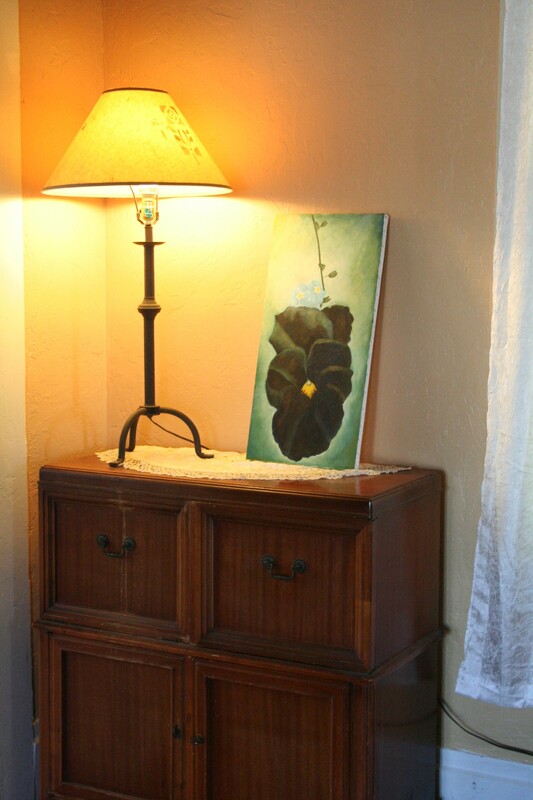 I love that all of our shabby furniture somehow looks beautiful in this house. Is it the floor? Wall color? It’s something. I love it. The couch cover is a recent addition, though it’s been packed in a box all this time. We had to prevent Booker from eating the rest of the couch. The brown chair is circa The Farmhouse. 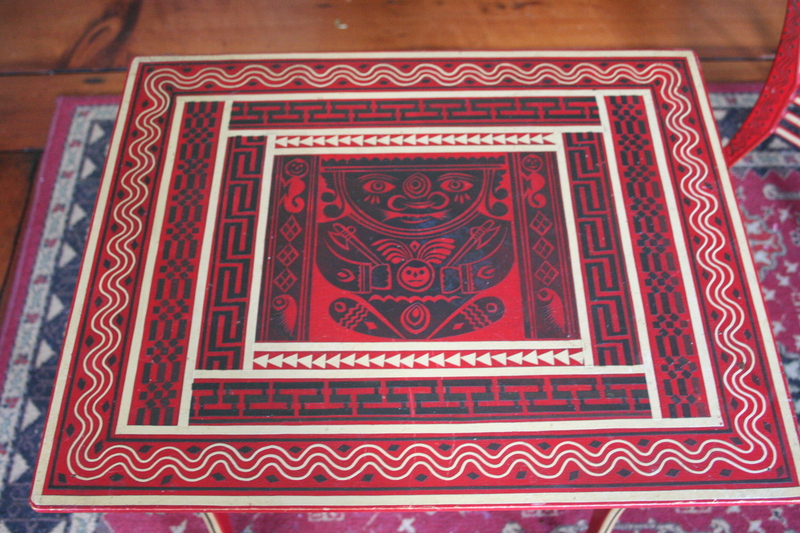 The coffee table — I think — was a hand-me-down in the late 90s, and then I gave it to Rob, and he pulled it back out of storage a few years ago when I was again tableless. The couch — $20 on craigslist. This room is home to the buffet (on the left) and the piano (on the right). This room is off the living room downstairs. It was a bedroom when we bought the place, but we took off the door, added a baby gate (to keep Booker out), and made it the kids' playroom. They play basketball and soccer, fight with swords, build train tracks and lincoln log houses, and endless other activities. The big boys mostly just play on the computer, but they do have some good fun in here, and this is where Sam entertains "baby Silas," as he calls him. 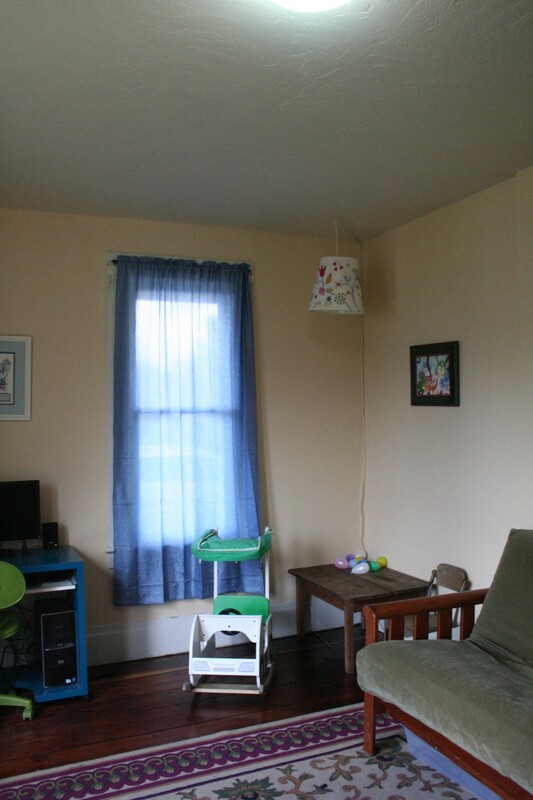 Someday this corner of the room will have some creative application of chalkboard paint on the walls. Hopefully, I'll get it done before the kids have outgrown drawing on the walls. The rocking golf cart -- thrift store find. This room is really fun and busy, and the best part is the kids know that it's theirs. 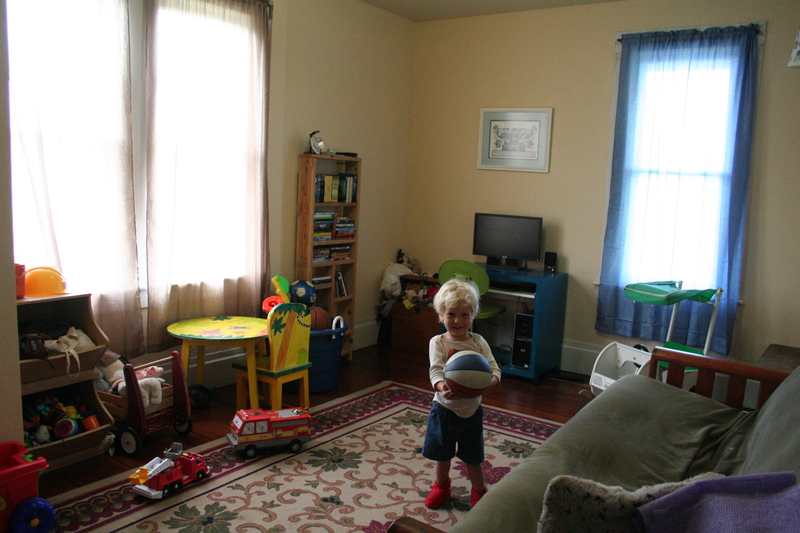 The playroom is the only reason why our living room remains uncluttered -- we have a place to put all the toys. 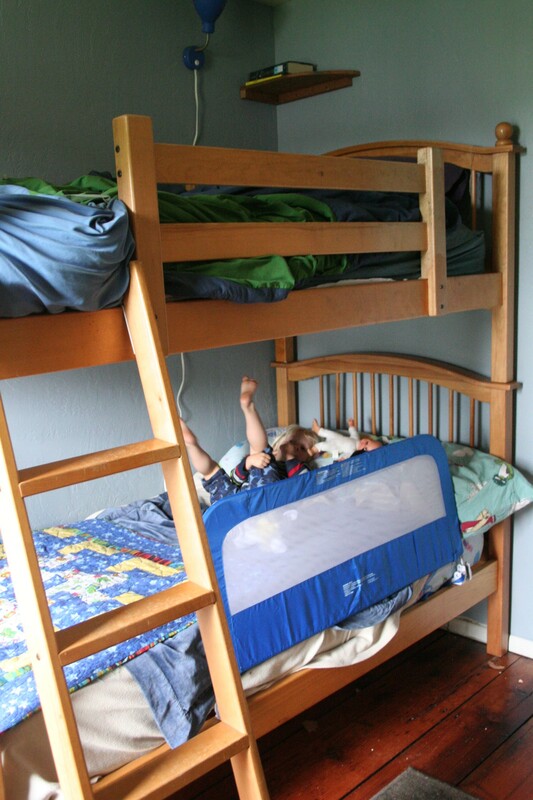 But this is also our guest room, so we have a backup plan for most of the kids' clutter when we have guests (and we'll put the door back on before you come stay).